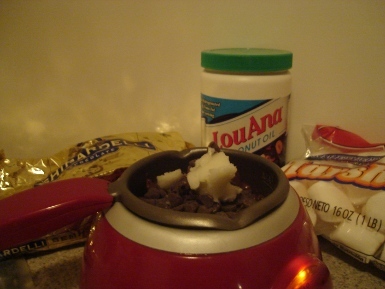 Gluten and Casein Free Chocolate Covered Marshmallows Recipe. Making your own chocolate candy is easy. If you are gluten and casein free, most commercial chocolate candy is off limits because of the casein in milk chocolate. So we will make our own! First you need to have something to melt the gluten and casein free chocolate semi-sweet chips in. I use a chocolate melter. A fondue pot works too. The electric ones keep the temperature just about perfect. If you don't have these items, you can still do this, it just means you have to be a little more careful. A double boiler will work best. If you don't have one, see if you have two pots that will nest inside each other. You may need to put a rack or something below the inner pot to keep it off the direct heat. The idea is to use the hot boiling water to melt the chocolate without scorching it from direct heat. If you can't do any of these, you can probably melt the chips in the microwave. The drawback here is that it won't stay warm while you are working with it, and it may change the texture or flavor of the chocolate. Whatever equipment you have, you can make it work. Optional: A handful of raisins. All of these items are available at WalMart. I use the Ghirardelli semi-sweet chips. They are gluten and casein free. They do contain soy lecithin, but that is an emulsifier, and usually is tolerated by most people. Walmart's Great Value brand marshmallows are gluten,casein, and soy free. I use the LouAna brand of coconut oil they carry. (keeps on the shelf). Kraft marshmallows(large)are also gluten free. Pour the cup of semisweet chips into the melting pot. Add 1 1/2 teaspoons of coconut oil. Turn heat on and let chips melt. While it is melting, get a cookie sheet. Cover it with a piece of waxed paper or parchment paper. You will need something to stab and hold the marshmallows with ( a fork works), and a scraper tool or butter knife. When chocolate is melted and smooth, turn off the heat if using the double boiler. The water will stay hot enough to keep the chocolate workable for at least 20 minutes or so. (You may need to put some aluminum foil over the water on the side you are working on so you don't get scalded by the steam.) If using a fondue pot or a chocolate melter, turn to low. 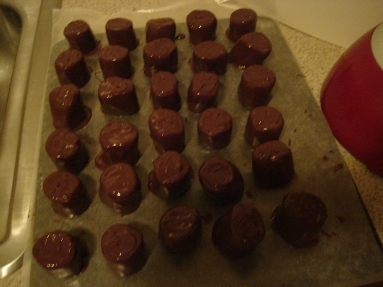 Stir the chocolate to make sure the coconut oil is evenly distributed and the mixture is smooth. Stab a marshmallow, dip it into the chocolate to cover, and then tap it on the side of the pot to let the excess drizzle off. Use the butter knife or tool to remove the pooled part at the bottom (leave enough to coat the marshmallow) and then put the chocolate covered marshmallow on the waxed paper to set. Continue until all the marshmallows have been covered. The marshmallows will look shiny until they set, then they will be more dull colored. Once the marshmallows have all been covered, either set the cookie sheet in the refrigerator to speed up the set (20 minutes) or if the room is cool, let them set up on the counter(about 40 minutes). I keep them in the refrigerator so they will stay fresh longer. That's all there is to making your own gluten and casein free chocolate! If you have chocolate left over, put a handful of raisins in and stir them until they are covered. Put them on waxed paper like the marshmallows until set. Make sure to separate them into individual raisins. Enjoy!